The overall revenue in the global perfusion systems market is estimated to breach a billion mark by the end of 2022, which is a reflection of a number of factors such as increasing demand for organ transplantation as a result of increases geriatric population and lifestyle inflicted cardiovascular and respiratory diseases, recent technological advancements, and increased number of awareness programs run by governments and NGOs to promote organ donation. On the other hand, high cost of devices and consequently extremely high cost of organ transplant that takes it out of range of various prospect patients and the dearth of organ donation are some of the factors challenging the global perfusion systems market. Nevertheless, growing preference of continuous manufacturing and prospering pharmaceutical research in emerging markets are expected to open new opportunities for the vendors operating in this market. 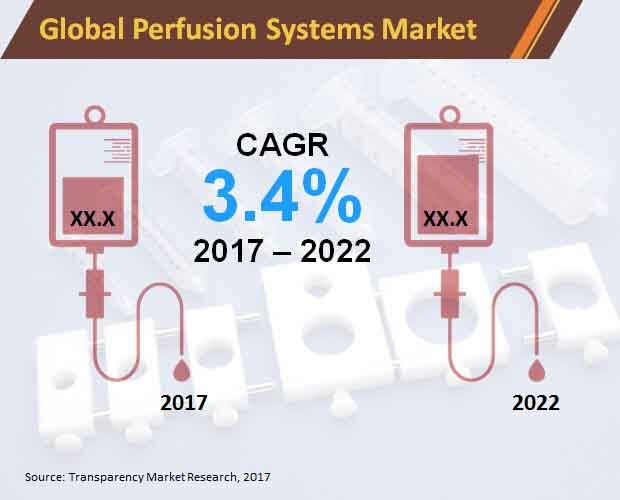 The demand in the global perfusion systems market is project to increment at a CAGR of 3.4% during the forecast period of 2017 to 2022, when the market will be worth US$1,164.1 mn, substantially up from its evaluated valuation of US$985.6 mn in 2017. On the basis of product type, the global perfusion systems market has been segmented into cardiopulmonary perfusion, cell perfusion, and ex vivo organ perfusion. In 2017, cardiopulmonary perfusion systems market produced a demand worth of US$537.9 mn and represented 54.6% of the overall demand in the global perfusion systems market. The cardiopulmonary perfusion systems can be further sub-segmented into heart-lung machines, perfusion pumps, cannulas, oxygenators, monitoring systems, and others. During the forecast period of 2017 to 2022, this segment is estimated to expand at a CAGR of 3.5% to reach a valuation of US$637.5 mn, which will represent 54.8% of the total demand in this market. The cardiopulmonary perfusion systems segment is producing US$19.9 mn annually over the course of the forecast period, and this absolute growth is larger than any other segment. Based on end-users, the global perfusion systems market has been bifurcated into hospitals, ambulatory surgical centers (ASCs), specialty clinics, and others. Currently, hospitals account for the maximum share of the demand and will continue to dominate throughout the forecast period. However, ASCs are incrementing the demand in various developed regions, whereas specialty clinics are mushrooming in emerging economies. Geographically, this report takes stock of the potential of perfusion systems market in the regions of North America, Europe, Latin America, Asia Pacific except Japan (APEJ), and the Middle East and Africa (MEA), as well as in the country of Japan. In 2017, North America emerged as the most lucrative regional market, serving a demand for perfusion systems that was worth US$385 mn in 2017. The demand in the North America perfusion systems market has been anticipated to expand at an above-average CAGR of 3.5% during the forecast period of 2017 to 2022, by the end of which it will possess a revenue worth of US$457.8 mn. This significant demand for perfusion systems in North America is a result of increasing need for transplant surgery in the developed countries of the U.S. and Canada. As per the U.S. Department of Health and Human Services, approximately 119,000 people were waiting for various organ transplants while merely 2,555 donors are available as of April 2017. Europe is currently the second most profitable region in perfusion systems market, projected to constitute a demand for perfusion systems worth of US$337.9 mn by the end of 2022. The APEJ perfusion systems market is projected to be worth US$175.2 mn, expanding at a CAGR of 3.3% during the said forecast period. Some of the prominent companies in the global perfusion systems market are: Hitachi Ltd., General Electricals Inc., Toshiba Corporation, Koninkliijike Philips N.V., Samsung Electronics Co, Ltd., Medtronic PLC, Shimadzu Corporation, Siemens AG, Accuray Incorporated, Organ Assist B.V., Xvivo Perfusion AB, Organ Recovery Systems, Paragonix Technologies, Inc., Waters Medical Systems, TransMedics, Inc., Bridge to Life Ltd., and OrganOx Ltd. Most of these players are involved in research and development of technologically advancement product that aid in enhanced ex vivo perfusion.